From October 1-7, 2018, libraries in Nova Scotia will be focusing on Seniors. A variety of programs and events are being offered - please check with your local library to see if something appeals to you and your family. Seniors Week is one of the many activities taking place in October, Canadian Library Month. The Kentville Library celebrates Architecture Week. Come in and see our exhibit of architecture panels in the lobby. The display will be open to the public from October 1 to 5. On Friday we will wrap up the festivities with a closing reception from noon to 2pm. Weekly board games in the Activity Room for adults and teens. *Please use back door* Games Night events are organized by Valley Game Night in partnership with AVRL. 6 p.m.
Rosa M. Harvey Library 25th Anniversary Celebration! Drop in for cake and refreshments as we celebrate 25 years in our location. 10-3 p.m.
Come knit with us. Bring your project, your materials and join in the fun. Tea is provided. 12 noon – 2 p.m.
We'll provide an assortment of games, you provide the conversation and laughs! For adults 55 and up. 6:30-8 p.m.
For knitters, hookers, crocheters, weavers and spinners ... and all other fibre craft artists. An opportunity to share stitches & time. Bring your own project and join us for a cup of tea and a chat. Every Wednesday afternoon from 1-3pm. Everyone welcome! For more info call the branch during open hours at 902-684-0103. Curling up with a good book is a great way to spend an evening. Another great way to spend an evening is to sit around with a group of friends and share thoughts and ideas about these books. Come and join us for great company and lively discussions! We will be discussing "Room" by Emma Donoghue and hand out next month's selection "Witches of New York" by Ami McKay. If interested, please call the library at 902-825-4835 for details. 6:30-8:30 p.m. In honour of Seniors Week, the Bridgetown Rug Hookers will hold their October 4th meeting at the Library. New participants are welcome. Please bring your own lunch. Coffee and tea will be provided. 10 a.m.-2 p.m.
Connect Hearing is offering free hearing health checks at the Berwick & District Library. Please call to book an appointment, 902-538-8060. A check will take about 15 minutes. This is only for adults. Please call or drop in to set up an appointment if you have not had a recent hearing check and do not wear hearing aids. New to the area? Looking for work in your field but not getting anywhere? Enjoy a game of Trivia, find out about the Valley Connector Program, and grow your networks. 6-8 p.m. Sign up at www.valleylibrary.ca Hosted by the Valley Connector Program. In conjunction with "Senior's Week", drop-in to the Kingston Library for conversation, displays and subject matter from a simpler time. Sing a song or two and light refreshments will be served. 1 p.m. The Kentville Library celebrates Architecture Week. Come in and see our exhibit of architecture panels in the lobby. The display will be open to the public from October 1 to 5. On Friday we will wrap up the festivities with a closing reception from noon to 2 p.m. Spend your Friday afternoons playing games at the library. Skip-Bo, Scrabble and more! For Adults. Please call the library for details at 902-665-2758. Weekly board games in the C@P Lab for adults and teens. 7 p.m. Games Night events are organized by Valley Game Night in partnership with AVRL. Join us for an informative program about Centreville resident, Charles Macdonald and the Faerie Cottages he built at Huntington Beach. 10:30-11:30 a.m. Many readers have been following the adventures of Claire and Jamie Fraser in the popular ‘Outlander’ series by Diana Gabaldon. The Louisbourg Library will be offering an ‘Outlander’ evening, with talks on some of the Celtic traditions and themes that weave into the ‘Outlander’ series, such as highland faeries, Scottish battles and rebellions, and clan crests and tartans. Guest speakers include, Ronald Labelle (CBRL Storyteller in Residence), Scott Moir (CBU Associate Prof in History & Folklore) and Deana Lloy of Red Label Kilts in Sydney. The evening will also have traditional music and food. This FREE program is organized by the Cape Breton Regional Library and hosted by the Louisbourg Playhouse. For more info. phone the Louisbourg Library 902-733-3608. Bring your current craft project to work on and library staff will put the tea on! Drop in with your fibre craft project for conversation and a cup of tea. All ages welcome to Friday Night Knitting Club. The practice of mindfulness meditation can help reduce stress and promote awareness. Baddeck Library’s weekly meditation group has been going strong for several years, and warmly welcomes new folks. Drop by on Saturdays at 5:00 and check it out! Please join Craig Graham with Service Canada, for a presentation on the Canada Pension Plan and the Old Age Security benefit. This presentation is intended to give you general information about the OAS and CPP pensions. Join us as we get creative! It could be knitting, crocheting or other crafty creations. For more information on this new program, call (902) 396-5022. All are welcome to join us this evening for an author reading & presentation by Jamie Simpson, of the his newly published book "Eating Wild in Eastern Canada: a guide to foraging the forests, fields and shorelines". An illustrated narrative guide to collecting, cooking, and eating wild food on the East Coast. Tonight's program is co-hosted by the Pictou County Naturalists Club. Copies of the book will be available for purchase. Join us for a variety of speakers along with some tea, coffee and light snacks! All are welcome. For more information or to suggest a speaker, call (902) 863-4276. Today we welcome local author, Gary Chisholm, to share his book, "Run, Benny, Run". We will also be joined by special guest, Benny Lagundzija. Ab​out the book: The gripping, true story of a brave young man, Benedikt Lagundzija and his family dealing with the horrors of World War Two, in Nazi occupied Yugoslavia. The reader will feel Ben's pain and joy as he escapes and eventually comes to Canada. Stop in, connect with others and knit! All are welcome, for more information call 902-863-4276. Join us as this month, with special guest, Tonya Francis as we celebrate Mi'kmaq Heritage Month together. Experience Mi'kmaq history and culture which honors their rich tradition, values and way of life. Tea, coffee and light snacks will be served, for more information or for speaker suggestions call (902) 396-5022. All are welcome! Interested in learning Gaelic? Drop in and meet others that are interested too! For more information and to register in advance, call (902) 485-5021. Drop in and help us celebrate Canadian Library Month by experiencing what else the library has to offer beyond books! Did you know that the Library has a 3D printer, a button maker, or a WiiU? Come by to try out a new to you technology that is available at the New Glasgow Library. All ages are welcome. For more information, please call the New Glasgow Library, (902) 752-8233. Drop in to knit and crochet with others every Thursday afternoon. Bring your own yarn and needles, patterns and written instructions will be available. For more information, please contact the library at 902-485-5021. Join us for a 4-week digital photography course with James Smeaton, a local photographer, who will be sharing his professional tips for great pictures using your cell phone camera. The course will be held over 4 weeks and will conclude with a showing of each participant’s favorite picture printed and framed. There is no cost and we ask participants to bring their own smart phone. Registration is required. For more information, and to register, please contact the Antigonish Library at (902) 863-4276. Books, discussion - repeat! Join us for our monthly book club where we will chat about what we read. For more information, or to arrange for a copy of the book - please call the River John Library, (902) 351-2599. Join us for this information session on the Women on Wheels program for a healthy snack and a ride. In partnership with Pictou Recreation, connect with other women through this group, enjoy short bike rides on local trails and roads, and learn new skills! Join the library and the RJ Square Knitters for a fun morning of stitching and chatting! All are welcome. For questions, call (902) 351-2599. Join us for an afternoon of stitching and conversation in the cozy atmosphere of the Stellarton Library. All are welcome (please bring your own needles, yarn or hooks). For more information, please call the library (902-755-1638). Description: Sharing stories, discover your community! All welcome to drop-in and join us today, for a social time with friends and neighbours - for a game of cards, Scrabble, jigsaw puzzle... and enjoy a cup of tea with oatcakes. For more information, please contact the Pictou Library at (902) 485-5021. 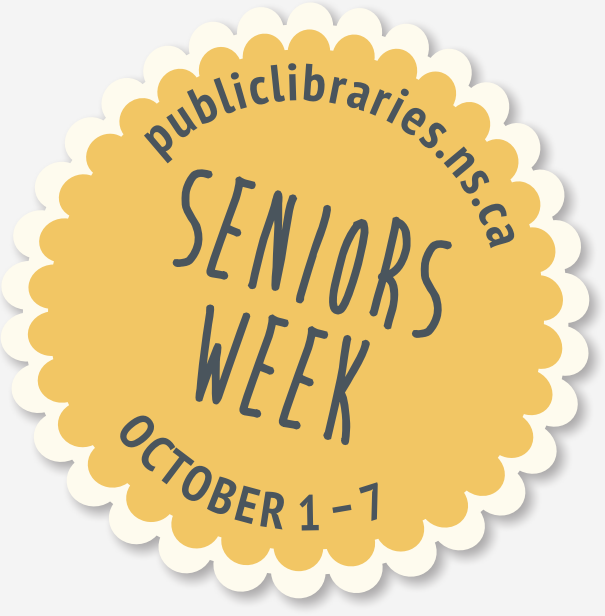 October 1 to 7, 2018 is NS Public Libraries Seniors Week. Seniors age 50+ are invited for an informal friendly game of Cribbage, Scrabble or Skip Bo. This is an evening for seniors to join in the fun of our Adult Colouring night. All are welcome. October 2, 1:30 to 4 p.m.
Join us for an afternoon of coffee and conversation. Meet your neighbours and share your interests. Find a good book to take home. October 2, October 3, October 4, October 5 3:30 to 5:30 p.m. Older adults can gather, socialize and colour with friends. / Les aînés peuvent se rassembler, socialiser et colorer avec des amis. As part of Seniors Week, there is an information session on financial wellness with Lisette Saulnier of the Caisse populaire de Clare. She will discuss senior financial abuse, how to recognize if you or a loved one are being taken advantage of and what advanced planning tools you can use to protect yourself or your loved ones. This is in partnership with Caisse populaire de Clare. Older adults can join us for an evening of fun card games such as Wizard, Auction 45 and Fours. If you do not know how to play these games, we will teach you. October 4, 6 to 8 p.m. This is an evening for seniors to join in the fun on Hand Crafters Night. All welcome. October 4, 10:30 to 11:30 a.m.
Yoga instructor Tamara McIntyre will lead participants through a session of one of the most beneficial kinds of yoga for seniors. Drop-in for a light refreshment and local musical entertainment. October 6, 10 a.m. to 12 p.m. This day celebrates Seniors Week by offering a day for older adults to get together and play board games and cards. October 6, 2 to 3 p.m.
Instructor Emily Stewart will lead participants through a fun-filled session of belly dancing for fun and fitness.